So, as part of my Burda Challenge 2013, I’ve sewn up DD1 a pretty little sundress from the April issue. It’s petite-sized (17-21), which seems to work well with DD1 as she is short-waisted. I cut a straight size, although I did change up a few things. First, I raised the CF neckline by about 2 inches. Actually, I started out with a 4 inch adjustment, but it was too high. The bodice provides perfect coverage. I was surprised, actually, because the model in the Burda issue seams to be falling out of it. I was expecting to have to do a small FBA, but the coverage is high and wide as drafted, which is great. And instead of the recommended lace, I cut bias strips 1 cm wide and gathered them for the bodice trim. Lace isn’t DD1’s thing, but the small ruffles are a nice touch. I underlined the entire dress. 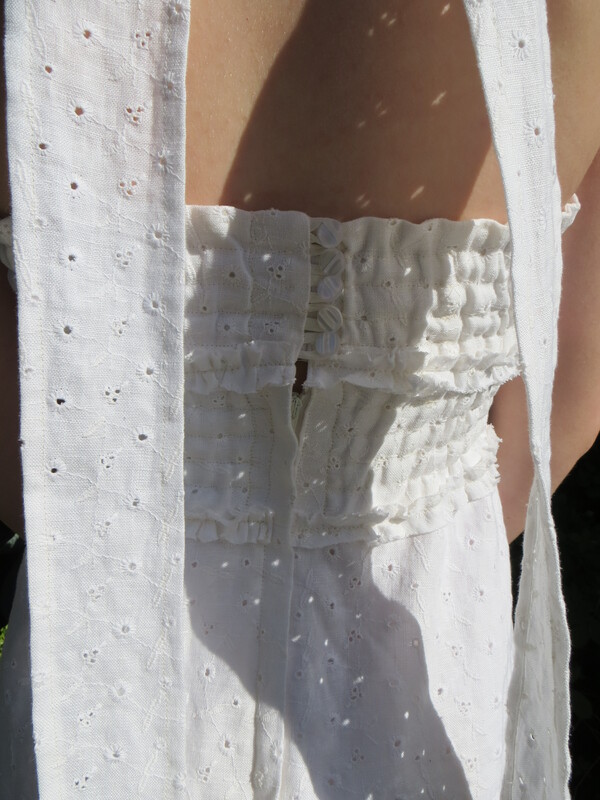 The skirt is underlined with a poly-cotton broadcloth, and the midriff and bodice to the shoulders are underlined and lined with a handkerchief linen and cotton voile. And I don’t know what happened with the pleats. They have moved to the side considerably once I snugged up the back. Funny, but I never noticed until looking at the picture how out of place they are! Oh, and I added bra cups at her request. Very pretty. Adding the ruffle is a gorgeous detail, and the elastic back very clever! Oh, so pretty! She needs to be skipping through a field of daisies on a sunny summer day. 🙂 (Hmmm, now I really want to skip through daisies and it’s sunny here today). Lovely dress and happy DD again. Its all good. Another delightful dress. I like the changes you’ve made. What a beautiful dress for your daughter. You and Burdas get along well! The dress is lovely. Your daughter looks very beautiful and she seems to really enjoy the dress. I adore her shoes, too. This is so lovely! 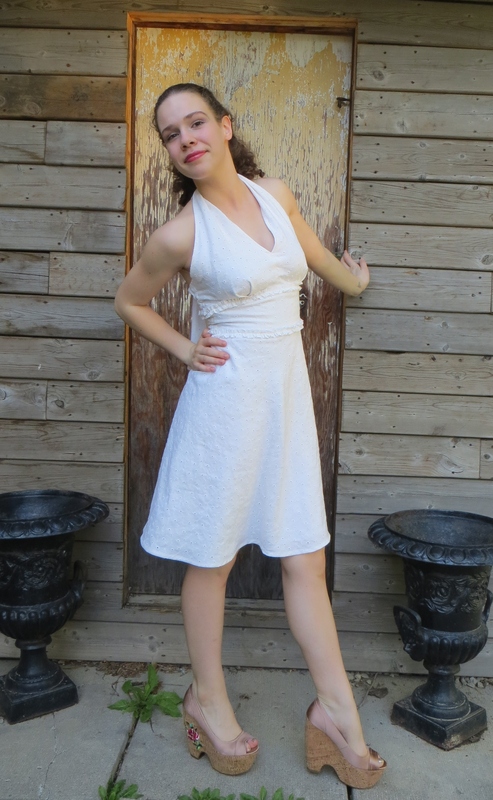 You are so right – the Burda model seems half naked on the picture so I never considered making the dress, but the way you handled the neckline has really inspired me to try it too. It is beautiful! Beautiful! I like your ruffle instead of lace detail. A very pretty dress and it fits your daughter perfectly, too. I love her shoes! I like the ruffles on the dress it adds a bit of whimsy. Such a lovely, fresh dress – very pretty!